Today we're taking a look at Raising Cane's. It is a highly specialized fast food concept, so if you don't like chicken fingers, you're out of luck: it's all they serve. They certainly make an effort to excel in the one entree they offer: Raising Cane's uses only fresh chicken tenderloins (that's right, never frozen) marinated for 24 hours. As they say on their website they "only have one love, great tasting chicken fingers" and "consistently serve an exceptionally high quality product with fast food speed and convenience." Named after the yellow Labrador retriever of the founder, Raising Cane's opened their first restaurant in 1996 outside Louisiana State University. They now have about 45 locations primarily in Louisiana, but also in Texas, Oklahoma, Alabama, Colorado, Georgia, Mississippi, Nevada, Nebraska, Ohio and Virginia. 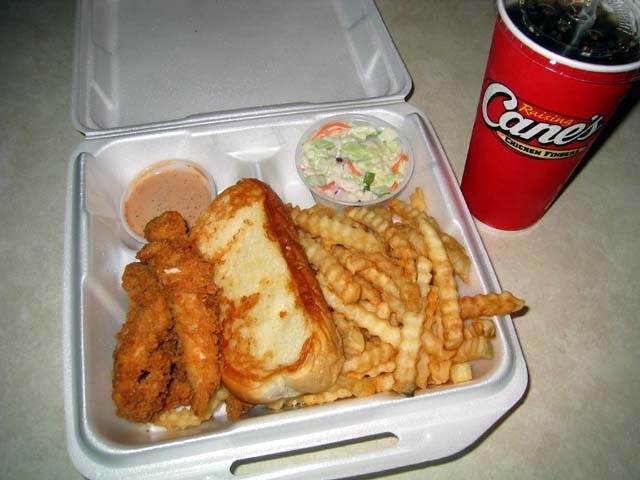 Raising Cane's keeps their menu simple with a few variously sized 'boxes' on the menu that always include chicken fingers, crinkle-cut fries, a drink, and their Cane's Sauce; and might also include coleslaw, Texas toast, or a Kaiser roll to make a sandwich. I'm impressed that they link to their position on food safety from the main page of their web site. It's nice to see an emphasis on quality and safety. hey, do you know how many calories in each combo??? email me @ sarah2yea@aol.com and let me know. thanks! Guthries Chicken is a very similar concept. They have 24 stores across the southeast and they were founded in 1965.
was anyone able to discern a calorie count for the food at all? I'd really really appreciate an email on that. Same here... I'd love to know the Nutrition Facts for Raising Cane's food! My email address is Kelly@dietFacts.com and my fax # is (312)-803-1918. Thanks! I would like to know the nutritional information also. My e-mail is rockgurlslu@yahoo.com. please also forward any nutritional information to s2graham@hotmail.com Thanks! The founder of Canes Todd Graves worked for Guthries in the early 90's in Athens, Georgia. The menu is the same but Guthrie's by far is better. Graves actually wormed the Guthrie's out of the Athens store where he worked to steal the trade secrets. graves actualy won entrepeneur of the year for his copy of Guthries. This was from restuarant news magazine. He claims in his stores that he is the original. I personally ate many "golden fried chicken fingers" at the original Guthrie's in the 1970's The same thing can be said about Zack Mclroy founder of Zaxbys. He worked for Guthrie's, also. Hey, since everyone seems to want to know the nuitrition facts, can someone just post them? Or is that some sort of copyright violation? wtf why does everyone want the nutrition facts? for one thing, it's a box full of fried food, i think it's safe to say it's not nutritious. i'm not knocking it, i'm personally a huge fan of Cane's. but i don't see why the nutrition facts (something like, 50 fat grams, 1000 calories, etc) are that important. Thank you for taking the time to email us. It seems like we are all counting calories and watching our diets these days. An active lifestyle and balanced diet is definitely the way to go! At this time, Raising Cane’s does not perform nutritional value testing on the food we serve. We can tell you that each chicken finger weighs approximately 1.5 to 1.7 oz and a serving of our crinkle cut French Fries is approximately 5 oz. Since portion size also plays a key role in a healthy diet, we hope that this information allows you to plan appropriately for your individual diet needs. Thank you for allowing us to serve you and we look forward to the next time. Nutritional information is very important as a tool. I lost 40 lbs two years ago simply by counting calories and exercising - no gimmic diets, etc. Know what? I also ate at places like Popeye's and McDonalds - not just a sub a day from some other chain. If you know what's in food - even "unhealthy" food, you can plan your diet accordingly. Sorry, but isn't it illegal these days for them to not make that kind of nutritional information available to consumers? If you are that worried about calories you shouldn't be eating there. For crying out loud it is FRIED CHICKEN and french FRIES. It is fattening. Go eat a salad and drench it in dressing so you can stick to your diet. OK, the food taste great, they do not advertise the nutritional info... It must be very unhealthy. However, knowing how bad will tell me how good I have to be over the next several days or weeks. Once again, it taste great. Re: "Sorry, but isn't it illegal these days for them to not make that kind of nutritional information available to consumers?" Question: Do all foods need to bear nutrition labeling? 3. Foods served or sold in establishments that serve food for immediate consumption (e.g., restaurants, schools, cafeterias, trains, airplanes, and retail stores such as bakeries and deli's that have facilities for immediate consumption) or that are sold for use only in such establishments (# 101.9(j)(2)). People on diets don't eat just salads. They don't advertise the nutritional facts b/c they are still a small company. Duh! I'm sure fried chicken joints, pizza places, and McDonalds will kill you way faster than this place. Not everyone that wants to know the nutritional facts are on diets. Im diabetic and I have to know the carbs in everything so I can take the right amount of insulin, but I guess I could eat salads for the rest of my life huh? I know Cane's wont give us info, but there are other ways to estimate the calories and fat in a product. I use www.calorie-count.com. This site is very useful and u can use it to determine the nutritonal facts on anything. I found that chicken fingers are 127 calories each and 7 grams of fat. Fries are 291 calories and 15 grams of fat. The toast is trickey one but i got 120 calories and 1 gram of fat and 1 gram of fiber. So far a combo at Canes let's say the most popular the 3 finger combo without the drink is 792 calories and 37 grams of fat. Wow I didnt't realize it was that much. Think I will start ordering the kids meal, lol. I hope this helps everyone. And again this is just an estimate from using fried chicken fingers, french fries, and texas toast as my search. I'm not sure why calorie count is so important. It's fried food. It's going to have a lot of calorie's period. It's something that you eat in moderation. Not everyday kind of food. As for what's in the sauce. I know for certain it's ketchup and mayo mixed together with paprika and other spices. I'm disappointed that Cane's does not provide nutrition information, because I'm a pregnant woman trying to make sure I get enough protein in a day. Others have said they are diabetic or are counting calories. I'm surprised at the number of people here who are discouraging the seeking of knowledge and the empowerment that comes with it. Also, you nay-sayers don't know everything, and it's very judgmental to make the blanket statement, "It's fried, so if you're on a diet you shouldn't eat it." So does anyone know what the real nutritional facts are? Reply of "it's fried food, so it's unhealthy", is not helpful or scientific. We already know it's fried. We already know fried food contains a fair amount of calories. But if there are two restaurants that serve a fried item, maybe I want to visit the one that has a slightly less unhealthy offering. There are planning reasons to want to know the exact numbers. And to some extent, the exact numbers depend on what exactly they marinate their chicken with, and HOW they fry them. I.E. Do they fry them in lard, or something else? The type of grease they are using can have a profound effect on how much of various types of fats the food contains. Estimates based on merely the fact that it's chicken and that it's fried are interesting, but too imprecise. So can someone post or find a reference to more solid info? I have a program that calculates everything for you, in a category called "Chicken Breast Fried with Batter", I put in the average amount they mentioned (1.6 oz. ), and I get "118.4" calories per finger. So, If you buy "THE BOX" (unsweetened tea is your best option if you want to cut some calories from the meal.) 118.4 cal. times 4 "fingers" comes out to 473.6 cal. for just the fingers, then the fries would add 5 oz = 610 calories. Cole slaw from KFC is listed as: 190 calories. I used 1/4 cup 1000 Isle for sauce (236). 473.6 + 610 + 190 + 236 = 1509.6 calories. Getting the picture? I am surprised at how much I liked this place. I heard it was good, but I thought "its chicken fingers, how good can it be"? Now I can't get enough… so fresh and hot! The problem is that I am very health conscious and I like to make wise choices. And for those who don't see the value of finding out nutrition facts of fried foods, spend 15 minutes at the website of your favorite fast food place. You may be surprised at what you find. All it takes is a quick glance at the facts and you can shave 300 calories off a meal without any suffering. As for my guess about Cane’s - It's not breaded very heavily like Popeyes or Sonic, which makes me think that less oil is trapped in the breading. Less oil = fewer calories. Wishful thinking, I know! For now, I think I will stick to eating the 3 fingers and bread, but only a few fries and sugarless drinks. That should help cut calories quite a bit. Raising Cane's is freaking delicious! I ate it every day for a week and realized that I probably shouldn't do that. No, I'm not super fat or anything, but I am now on a diet. I haven't lost a pound since I had my first child, 18 months ago. I looked at myself in the mirror the other day, and I said, back to Weight Watchers I go. I really wanted to find out exactly the number of "points" it would be for "The Caniac" (the biggest option) just to make a point to myself and to see how much I could eat when I want to use my weekly allowance. This is what I configured, it is close to 40 points if you eat all of it and you drink a sweet tea. It's my fave. I love Raising Cane's. Don't you wish they could make diet food that tastes great!? I'm glad (or I hope) nobody took the time to e-mail sarah(deshotels) the answer. It's ridiculous how people do this, as if nobody else will be looking for the answer too. Yes, Guthries and Zaxbys are very similar to Raising Canes. However, both Guthries and Zaxbys serve smaller amounts and also have smaller chicken strips. Zaxbys also uses a salty batter for their chicken. Lastly, the prices for the meals are also similar, but Canes is the only one that includes a drink in the purchase of their meal, it is additional for Guthries and Zaxbys. So, if you like meals that are all the same price (very closely priced), but are smaller in amount and dont come with a drink, go anywhere but Canes. omg! i love raising canes :) they have to best lemonade and it goes great with their toast and chicken. i live right down the road from on and thats all i usually eat. but it is a bit pricey.